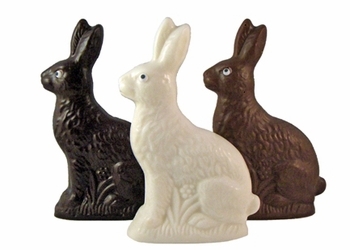 All of our bunnies are solid and available in milk chocolate. Some are also available in dark chocolate or white coating. Roscoe Rabbit - 3 oz. Harley & Daisy - 3.5 oz. Henrietta Hen - 3.75 oz. Horace Hare - 4 oz. Buckeye Bunny - 4 oz. Danny Duck - 4 oz. Little Lamb - 5 oz. Beasley Bunny - 6.5 oz. Rodney Rooster - 9 oz. Mr. Abercrombie - 15 oz. Herb, the Traveling Hare - 17 oz. Hopkins, the Butler - 43 oz.